Pretty gift for a pretty person as this Exquisite Happy Birthday Surprise Gift Basket will convey your message how beautiful the person is to whom you gift it. 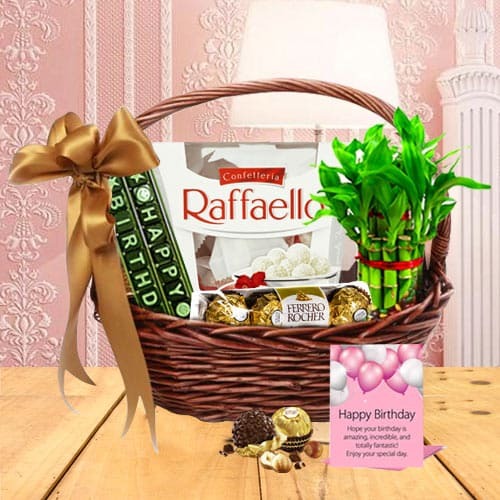 Surprise your loved one by sending this amazing collection of Birthday Gift Basket which comes with 3 pcs Raffello Chocolates, Bamboo Plant 2 tier, Happy Birthday SMS Chocolate, Happy Birthday Card and Ferrero Rocher-4 pcs. All these items are placed in a Basket with Birthday Party Accessories.